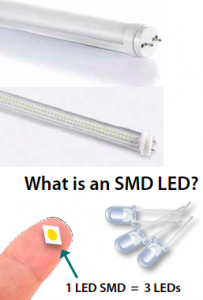 LEDs are small, very efficient solid bulbs. New LED bulbs are grouped in clusters with diffuser lenses which have broadened the applications for LED use in the home. Light Emitting Diode (LED) and Compact Fluorescent Lights (CFL) bulbs have revolutionized energy-efficient lighting. CFLs are simply miniature versions of full-sized fluorescents. They screw into standard lamp sockets, and give off light that looks similar to the common incandescent bulbs – not like the fluorescent lighting we associate with factories and schools. LED light bulbs will eventually be what we use to replace incandescent bulbs. 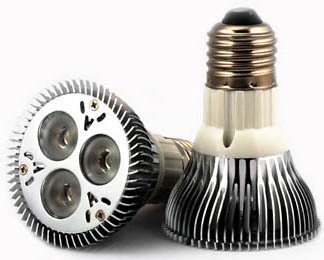 This trend is continuing, with LED bulbs being designed for more applications while the prices are going down over time. 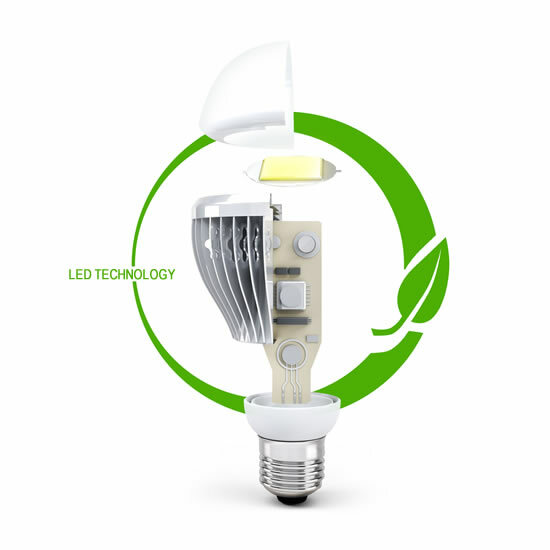 LED technology is advancing rapidly, with many new bulb styles available. Initially more expensive than CFLs, LEDs bring more value since they last longer. Also, the price of LED bulbs is going down each year as the manufacturing technology continues to improve. LED bulbs last up to 10 times as long as compact fluorescents, and far longer than any other lighting technology. These bulbs do not cause heat build-up; LEDs produce 3.4 btu’s/hour, compared to 85 for incandescent bulbs. Common incandescent bulbs get hot and contribute to heat build-up in a room. LED lighting performance actually improves in the cold. Good for refrigerated and freezer cases.  Although LEDs are initially expensive, the cost is recouped over time and in battery savings. 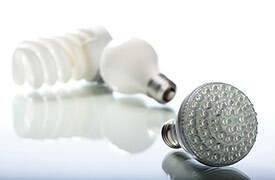 Today, there are many new LED light bulbs for use in the home and business, and the cost is becoming less of an issue. To see a cost comparison between the different types of energy-saving light bulbs, see our Light Bulb Comparison Charts. RoHS compliant and environmentally friendly, zero mercury or lead. No disposal fees. Estimate desired wattage – read the package to choose desired illumination level. For example, a 3W LED is equivalent in output to a 45 W incandescent. Choose between warm and cool light – new LED bulbs are available in ‘cool’ white light, which is ideal for task lighting, and ‘warm’ light commonly used for accent or small area lighting. Choose between standard and dimmable bulbs – some LED bulbs, such as the FEIT Electric bulbs, are now available as dimmable bulbs. In this style LED bulb, clusters of LEDs are covered by a dimpled lens which spreads the light out over a wider area. Available in standard Edison bases, these bulbs have many uses, such as area lighting for rooms, porches, reading lamps, accent lamps, hallways and low-light applications where lights remain on for extended periods. Designed for bathroom vanities or anywhere a globe bulb is required, these bulbs produce light equivalent to a 40-watt incandescent bulb, yet only consume 10 watts of power. Dimmable from 100% to 10%, these bulbs have a 200 degree beam angle to cast light in a wide area. Available in pin base or standard (Edison) base, LEDs are ideal for track lighting. LEDs do not contribute to heat buildup in a room because no matter how long they remain on, they do not get hot to the touch. Also, because they are 90% more efficient than incandescents, and last 10 times longer than CFLs, the frequency of changing bulbs is greatly reduced. LEDs are now available for standard recessed lighting pots and housings. They range from 7.5 to 17watts, with beam widths from PAR20 to PAR38. Several models are dimmable. Also, because they are 90% more efficient than incandescents. and last 10 times longer than CFLs, the frequency of changing bulbs is greatly reduced. Designed to replace T8 fluorescent tubes, LED tubes are available in 4 Foot and 8 foot lengths, which replace traditional 25-watt and 40-watt T8/T10/T12 fluorescent tubes. Because fluorescent lights are often installed in high ceilings in commercial sites, there are additional savings because the frequency of changing bulbs is greatly reduced. Cost Comparison between LEDs, CFLs and Incandescent Light Bulbs. While the initial cost per bulb is higher then a T8 bulb, the total lifetime cost of an LED light bulb is actually much lower than that of equivalent incandescent and CFL and fluorescent bulbs. Also the initial cost per bulb is less than the cost of a T8 system when ballast and disposal costs are included. Daylight Savings LED Lights use new generation SMD lights for longer life and consistent light. Taking into consideration energy costs as well as time and resources required to replace shorter-lived incandescent and fluorescent bulbs, an LED bulb has a much lower lifetime cost.